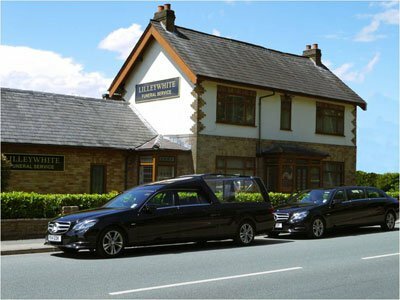 Liliewhites of Prestwich were on hand to help me through the toughest time of my life, arranging the funeral of my darling husband Phil. All the staff were considerate, kind and very professional. I was even allowed to take Spike, our dog in to visit Phil in the chapel of rest. (I probably benefited more from that than Spike did, but it was nice to have by my side.) I wanted the funeral to be a celebration of my wonderPhil's life, and Lilliewhites helped make that a reality by finding the music I wanted and putting the photos I provided on a memory stick to be shown at Blackely Crematorium. They put me in touch with John who took the service, he got the tone just right and he was also very kind and considerate of my wishes. As people were leaving the service, some of them said "Please don't take this the wrong way, but that was the best funeral I've ever been to, Phil would have loved it!" I wasn't in the least offended, as that was what I wanted for him. Many thanks again to all at Lilliewhites for your support and help. Please ask Lilleywhite Funeral Service to join Funeral Zone in order to get a free obituary.